The Gulf Coast Amateur Radio Club’s Tuesday Night Net is held on the WA4GDN club repeater On 146.670 Mhz at 7:30 PM. This is a Trader’s Net and General Information Net. If you have an amateur radio related item to buy, sell, trade, or want, you may list it here. All brief amateur related announcements may be made here. The Pasco County SkyWarn Wednesday Night Training Net is held on the WA4GDN club repeaters on 146.670 Mhz at 8:00 PM. You don’t need to be a meteorologist to be a storm-spotter! No home weather station is necessary, no fancy “chase wagon”. It’s possible to be a spotter by just looking out the window and reporting severe-weather phenomena. In fact, as a Ham Radio Operator, you can be of great assistance during severe-weather outbreaks. All you need is your eyes and a radio with which to report what you see. During severe-weather outbreaks, weather reports will be taken from any and all locations within the affected areas. 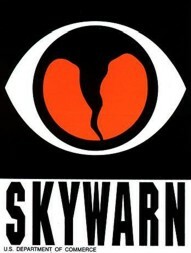 If the Skywarn Net is activated, the Lead Operator will instruct storm-spotters on what criteria must be met before reports will be accepted. You may check-in to the Net with your Callsign, SPOTTER NUMBER (if you have been issued one), name and location. Please be careful to report only conditions which closely resemble or meet those criteria given by the Lead Operator. ALWAYS go through net-control (Lead Operator), and give your information as clearly and calmly as possible. The net, if activated, can be heard on the 146.670 Mhz club repeater.